Ferryboats aren’t very useful in most parts of this country, but where they are, they can be very useful, carrying lots of people (and vehicles) to places that are difficult or impossible to get to by road. One of the problems with ferries (in addition to being slow) is that they are smelly, fossil-fuel hogs. The answer? Electric ferries! Washington State DOT (where ferries really are important, and in fact are considered part of the state highway system) has just announced that they will begin converting their older boats to electric power (story here). They will swap out the old diesel engines – due for overhaul anyway – with modern battery-powered engines. 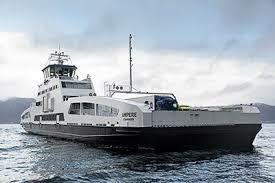 The Norwegians have been using a prototype electric ferry for a few years, with great results, both in terms of greenhouse gas emissions and operational efficiency (story here, video here, picture below). They report that the electric ferry Ampere, which has been in operation for nearly three years, has cut emissions by 95% and operating costs by 80%, compared to conventional boats. Good luck with your new venture WSDOT! The carbon pricing recommendation – “Reduce greenhouse gas emissions with a cap-and-trade market modeled after California’s program” – aligns with a growing body of opinion in the Northeast. · Linking up with California, Ontario, Quebec, and future jurisdictions who have similar programs. 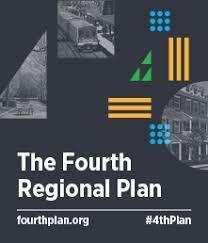 Carbon pricing is just one of 61 recommendations in the Fourth Plan, but it’s one that can provide great leverage toward the Plan’s goals of a more sustainable, fairer, healthier, and more prosperous region.